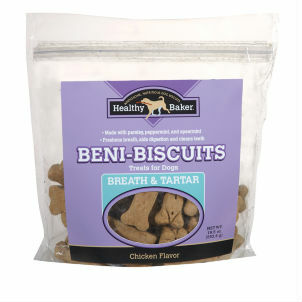 Made of high-quality, natural ingredients, these Beni-Biscuits for Dogs are healthy treats with added benefits for dogs. Chicken flavored Breath & Tartar treats feature parsley, peppermint, and spearmint to help freshen breath, aid digestion and clean teeth. 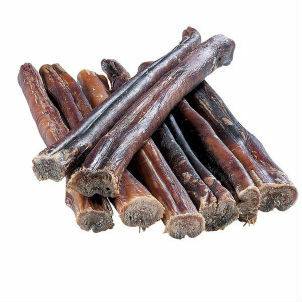 Bully Sticks are high quality dog treats with the genuine bully taste. 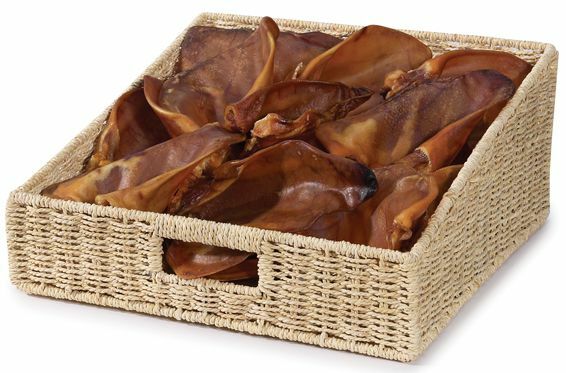 Dogs will be thrilled with these meaty dog treats. Made of all natural beef baked with a delicious smoked flavor that dogs love. 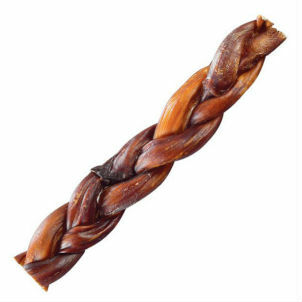 Braided Bully Sticks naturally clean teeth while providing a satisfying chew. All-natural beef is lightly smoked, braided, and roasted to perfection. Treats become chewy when moistened by dog’s saliva. Naturally cleans teeth while providing a satisfying chew. Treats measure approximately ½" thick for long-lasting chewing pleasure. Bully Springs Dog Treats put a new twist on these delicious doggie chews. Bully Springs are made from 100% natural bully treats coiled into a fun corkscrew shape. These spirals of delicious beef give dogs a unique chewing sensation. Treats are long-lasting and have a great smoked flavor dogs love. 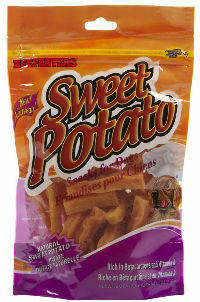 All natural, dehydrated sweet potato treats! Rich in vitamins as well as iron, calcium, fiber, and beta-carotene. 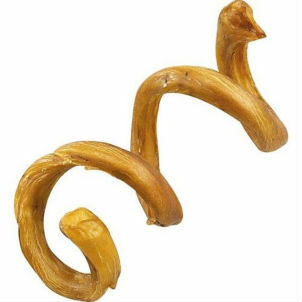 These dog bones feature raised dental tips that massage dogs’ teeth and gums while attacking plaque and tartar build-up. 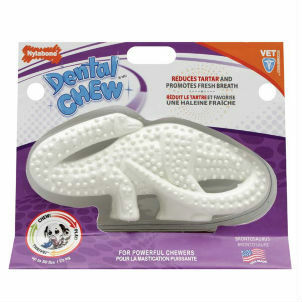 Dental Chews for powerful chewers are made in the USA. Durable Dental Dinosaurs measure 6". These all natural chews are made especially for those dogs that are older, or those dogs that may suffer from arthritis or hip dysplasia. 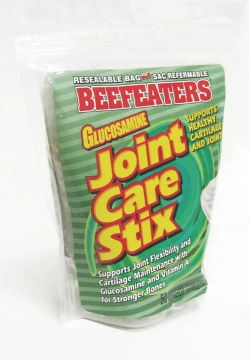 The stix contain glucosamine and extra calcium. 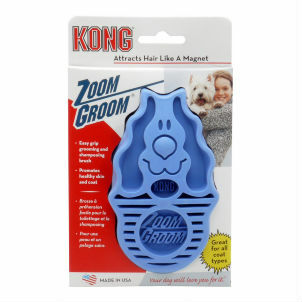 Zoom Groom Natural Rubber Pet Grooming Brushes are fantastic shampooers and brushes that work great in the bath and on dry coats. Brushes collect loose hair and provide a stimulating massage while conditioning the skin. It also works great as a shampooer, improving the effectiveness of regular and medicated shampoos. Our Ergonomic Undercoat Rakes remove undercoat and loose, dead hair with speed and efficiency. 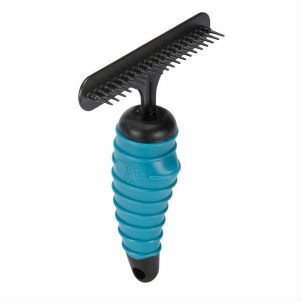 Rakes feature hardened steel teeth and a contoured handle for ease of use. Specifically designed by groomers to increase comfort and reduce repetitive motion injury, our Ergonomic Undercoat Rakes glide through coats. • Provides gentle cushioning and non-slip reassurance for greater control — even when hands are wet! Trim nails with greater speed, accuracy and efficiency! Ergonomic Professional Nail Clippers for pets feature ultra-sharp stainless steel blades that cut nails quickly and efficiently. The innovative ergonomic handles are shaped to fit your hand and are covered with double-bonded, ribbed, non-slip rubber that won’t come off! 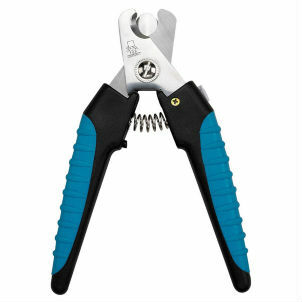 • Nail Trimmers are available in small and large sizes. 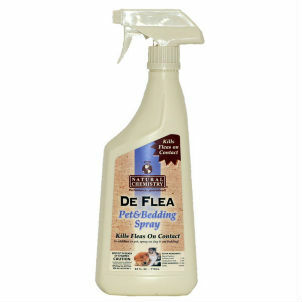 De Flea products are guaranteed to kill fleas, ticks, and lice safely and effectively! These gentle yet powerful products work on all stages of insects’ life cycle without using harsh chemicals or pesticides. All De Flea products can be safely used with other flea control products. 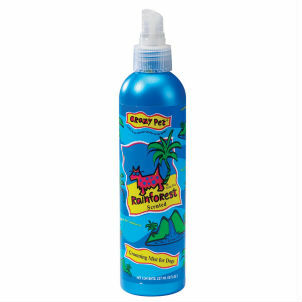 Pet & Area Spray is ideal for treating pets, carpets, beddings, furniture, and other areas pets frequent. Safe and effective spray eliminates fleas and prevents future infestations for up to three months. Itch Relief Spray discourages wound biting for faster healing. Itch Relief Spray is formulated with oatmeal, vitamin B5, and vitamin E to relieve itching and soothe dry, flaky, irritated skin. No-sting formula contains no steroids or alcohol. Contains Bitrix® to discourage wound biting for faster healing. Great for "hot spots," flea bites dermatitis, eczema, seborrhea, and scaling. 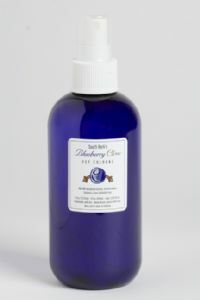 Itch Relief comes in an 8 oz pump spray. You and your pet will love the smell of the Mandarin Thyme Pet Cologne. Safe to use on felines too! A light & clean smelling scent. Mandarin Thyme pet cologne will keep your pet smelling fresh and beautiful. All natural, long lasting scent. Smells so good you will want to use it too! 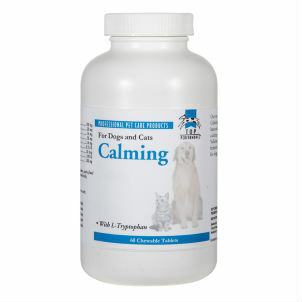 Calming Supplements feature several calming minerals and vitamins to help promote calm behavior in pets. Calming Supplements have a L-Tryptophan base and feature several supporting calming minerals and vitamins like Valerian root to help promote calm behavior in pets. Highly palatable and featuring a natural chicken and beef flavoring. Available in 60-count bottles. Oatmeal ’n Baking Soda Conditioner is a soothing blend of baking Soda, aloe vera, conditioners and colloidal oatmeal. It penetrates coats to simplify combing and lessen the pulling and tugging normally associated with untangling hair. Oatmeal ’n Baking Soda Conditioner gives coats a shimmering sheen, pleasant scent and beautiful look and feel. • Leaves coats with a pleasant scent and a brilliant sheen. 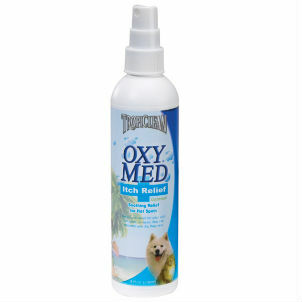 Professional-quality Medicated Pet Ear Cleaner quickly loosens and dissolves ear wax and reduces unpleasant odors. This medicated pet ear cleaner is safe for use on dogs and cats. Use weekly and before or after swimming or bathing to keep ears clean and healthy. This topical pet tear stain remover is a gel made of mild cleaners that may be used daily to remove stains from around pets’ eyes. 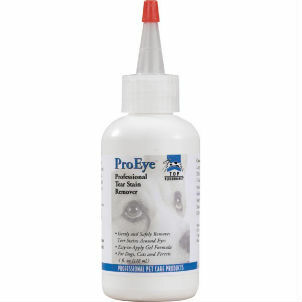 Tear Stain Remover is an effective, easy-to-apply gel formula that removes unsightly eye stains from dogs, cats, and ferrets. 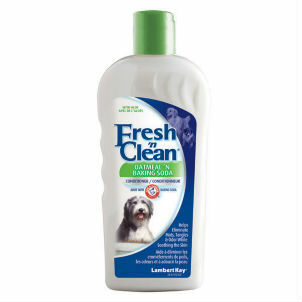 Made from a gentle blend of mild cleaners, it can be used daily on pets. Our Professional Ear Wipes are premoistened pet ear cleaner wipes formulated to be safe, effective, and easy to use. 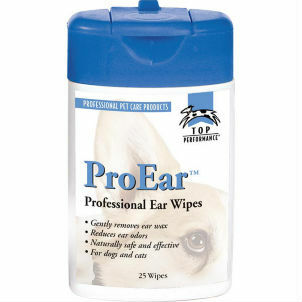 Professional Ear Wipes are formulated to gently remove discharge and ear wax from pet’s ears. Packaged in a convenient, stay-fresh, pop-up dispenser ideal for travel and quick cleanups. Keep dogs clean & healthy with Canine Top & Tail Professional Wipes. Pre-moistened wipes kill bacteria to prevent infection and remove dirt and debris. Our super handy, portable moist Top & Tail Professional Wipes are treated with an anti-bacterial, anti-fungal formula that can be used to wipe away debris around the mouth, tail, or anywhere pets need a quick clean-up. Use for travel, or for muddy feet after walks. Leaves a fresh, clean scent. 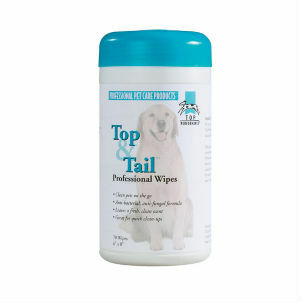 Canine Top & Tail Professional Wipes come in an easy-to-use, pop-up dispenser. 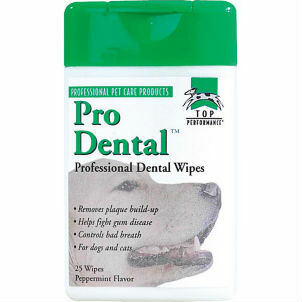 Dental Wipes are an easy way to keep a pet’s teeth and gums clean. Make dental care easy with the Dental Wipes. Great for use on dogs and cats that resist having their teeth brushed, these easy-to-use wipes safely and effectively remove plaque build-up, kill germs, and control bad breath. • Pre-moistened wipes come in convenient, stay-fresh pop-up dispensers. 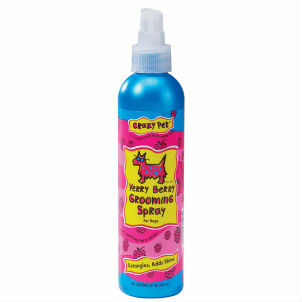 Crazy Dog Grooming Sprays are formulated to leave shiny, tangle-free coats that smell tropical and fruity. Have fun while you bathe and groom dogs with Crazy Dog Grooming Sprays. 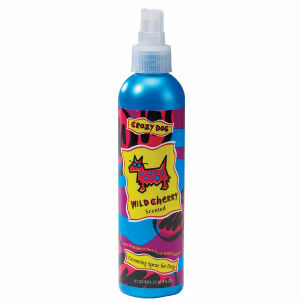 Crazy Dog Grooming Sprays leave shiny, tangle-free coats that smell tropical, fruity, and wild. Convenient 8 oz spray bottles of colognes are available in the scents listed below. Hot Spot & Itch Relief Tea Tree Spritz additionally remoisturizes skin & coat, and imparts a healthy shine & supple softness without leaving oily residue. Premium 3-in-1 Deodorizing Spritzes naturally eliminate pet odors between baths, remoisturizes coat and skin and impart a healthy shine & supple softness, without leaving oily residue.